Figure 23: The main staircase at Tan-yr-Allt, photographed in 1995. DI2011_1033, NPRN 16895. © Royal Commission on the Ancient and Historical Monuments of Wales. Each of the unique staircases examined in this case study appears in a wealthy household in north-west Wales between 1755 and c. 1760, when the vogue for interior design “partly after the Chinese manner” was at its peak. Despite the tease of a connection to the Pagets at Plas Newydd, who were early investors in, and continuing supporters of, the East India Company, there is no material evidence to connect the appearance of ‘Chinese’ staircases at Tan-yr-Allt, Bishopsgate House or Trefeilir directly with the East India Company either through individuals, families or trade. However, in the mid-eighteenth century all three households were in the possession of wealthy local landowners, who had good connections with the elite of Britain through marriage, politics and social station or occupation. The fashionable and affluent families in Britain at that time were spending money on renovating and refurbishing their homes, fitting out ancestral houses and summer residences alike with the newest and most fashionable goods available in a market that was growing not just in size, but in the types and variety of goods available. Consumer appetites for the novel and unique were inevitably influenced by the influx of goods from around the world, and in this instance, by aesthetics and material goods being imported from China by the East India Company. Sketches of buildings, people and objects by those who had travelled to China on East India Company business, alongside painted porcelain, Chinese silk and Chinese art all made their way into Britain and into the consciousness of the British public, through the East India Company. Designers such as William Halfpenny, alongside the more celebrated Thomas Chippendale and Sir William Chambers, took these things as inspiration and produced some of the earliest catalogues of furniture, featuring many items ‘in the Chinese taste’. Although the ‘barbarous gaudy goût of the Chinese’ was not received warmly by contemporary cultural critics, it was nonetheless an incredibly popular style that led to many wealthy homeowners purchasing ‘Chinese’ goods for their homes. [i] In north-west Wales, the British craze for China manifested in particular in the form of the ‘Chinese’ staircase. As with many local trends, it is likely that the trend started at one house with other local homeowners then mimicking the style in their own houses. While the earliest known surviving occurrence of a ‘Chinese’ staircase in the region is at Tan-yr-Allt in Bangor, it is not possible to conclude that this was indeed the first to be built: it may simply be the earliest extant example of which we are currently aware. It is equally possible that the trend for ‘Chinese’ staircases was sparked by a local craftsman adding the design to his repertoire, probably though exposure to works by Halfpenny, Chippendale and Chambers. However, at the time of writing it is not possible to determine who the manufacturer of each of the staircases was, or if the business was a local one. It must also be noted that the East India Company’s influence on ‘Chinese’ staircases across Britain does not end when the trend becomes outmoded, and nor does it end at the British border: ‘Chinese’ staircases are an interior design phenomenon found across the former British Empire, appearing in wealthy homes in the wider United Kingdom, for example at Wolverton Manor on the Isle of Wight, as well as further afield in places like Bohemia Farm and Sotterley Plantation in Maryland, USA, and St. Nicholas Abbey in Barbados. 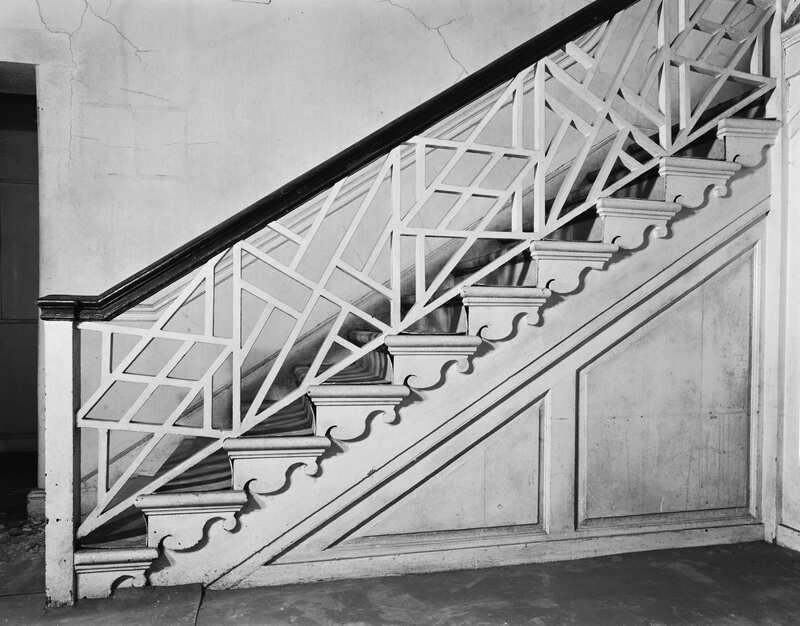 The staircases at these far-flung properties were mostly installed in the late-eighteenth or early-nineteenth century, and it has been suggested that were removed from their original settings in British homes when they became unfashionable and transported overseas alongside other items of outmoded furniture. In this way, the East India Company’s influence on the material culture of the home, and ‘Chinese’ staircases in particular, reached farther than might be expected and extended beyond the brief decade when the fashion for all things China was at its peak. [i] Charles Saumarez Smith, Eighteenth-Century Decoration: Design and the Domestic Interior in England (New York: Harry N. Abrams Inc., 1993), p. 143.